June 2014, Jereh group (SZ 002353), a Chinese professional oilfield environmental service company, finished its frac flow-back treatment of 12 shale gas wells for Shell China at Fushun, Sichuan province. This job is also Chinese first successful application of integrated shale gas environmental solution from waste transportation, storage to fluid purification and recycling, significantly reducing water consuming and operating cost, while ensure eco-friendly shale gas exploitation. The treatment was started by Jereh group in May, 2013. By now, the total processing capacity is 41,607m³ with 2,254 truck deliveries for 67,533m³ fluid transporting. According to the operation flow, after fracturing, the recovered flowback fluid by tankers is delivered to the processing center for electric flocculation, magnetic separation and fluid proportioning etc. and then reused for another operation. 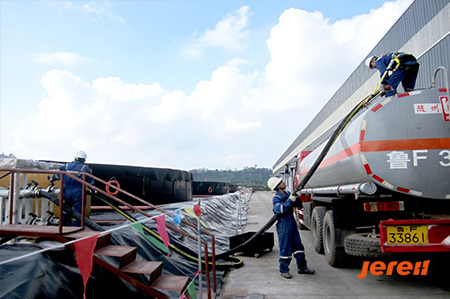 It is noted that Jereh sets seven mobile and modularized tanks, each 2.5m in height at dia. of 30m with processing capacity up to 10,000 m³. Meanwhile the inner wall and grounds are covered with HDPE impermeable film to prevent environment contamination. Along with the booming of shale gas commercialization in China, there are more focus shift on environmental protection from both the government and operators. Shell, a world largest oil company with leading HSE systems, together with Jereh application will lead more eco-friendly fracturing operations.